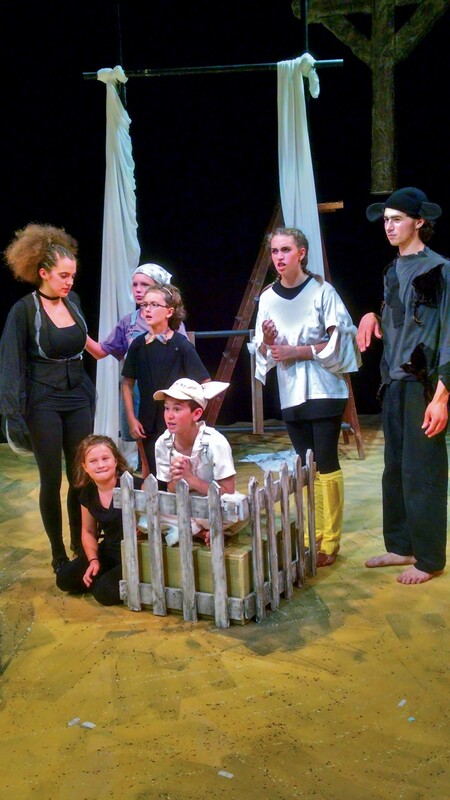 Putting on a Play | The Art Of | Kids VT - small people, big ideas! Montpelier's Lost Nation Theater is known for its polished productions. In July, it revived Stone, LNT founding director Kim Bent's award-winning original play about the Barre granite industry. But the company has a more youthful side: It runs a program for fledgling thespians called Theater FOR Kids BY Kids. This summer, its participants staged Charlotte's Web. At the final rehearsal, the cast and crew put finishing touches on the show. "What happened with props?" LNT artistic director Kathleen Keenan asked the group. "I know we have props." The actors should be using them all the time now, she continued, not just miming. The question set the actors into a flurry of chatter. Ten-year-old Dariush Sarafzade, who played Lurvy, the farm's hired man, asked Keenan to clarify when he should bring out the slop bucket. The Charlotte's Web camp, for kids age 9 and up, ended with four performances. Keenan's codirector, Shawn Sturdevant, worked with Bent to adapt the famous children's story for the stage, with original songs by Keenan. "Make sure you're not looking at the floor," Keenan instructed her charges during rehearsal. "Make eye contact with the audience." She paused, then asked the group what kind of theater they were in. "Three-quarters," the kids answered in unison. That means having an audience on three sides, Keenan reminded them. She demonstrated how to move properly across the stage in such a space: Think circles, not angles. One by one, each cast member practiced a circle walk. The group continued to rehearse, addressing issues as they cropped up. "It's a beautiful megaphone, but it's muffling your voice," Keenan told 11-year old Greta Zeankowski-Giffin, who played the narrator. "You need to hold it away from your mouth." Later, she reminded 13-year-old Justin Murray, the actor playing Wilbur, to stay faithful to his lines. "You're paraphrasing ... Please read it exactly," she said, stressing the poetry of E. B. White's words. Keenan and her colleagues intentionally treat the young campers like professional actors. "We believe that kids of any age will meet the standards that you set," Keenan explained. "You can have high expectations, and they will reach for those, and they will feel a great sense of pride when they get there. We're big believers in setting the bar high." Before his star turn as Wilbur, Justin performed as Jim Hawkins, the child protagonist in LNT's spring production of Treasure Island. "It's easy to say a few words, but to make them mean anything at all, that's the hard part," he explained. The success of a play depends not only on solid performances from the actors but also on smooth operations behind the scenes. Theater FOR Kids BY Kids provides opportunities for youngsters to work on lightning, scenery construction and backstage management. Seventh grader Maryam Sarafzade ran things backstage for Charlotte's Web. "Her job was to figure out where all the props belong, to track them, hand them off," Keenan explained. "Because we had multiple kids playing multiple parts, she was doing all those costume changes and making sure the costumes were where they needed to be for that quick change to happen." 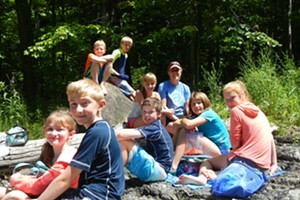 In addition to its summer camps, Lost Nation Theater offers school-vacation camps. All the youth programming has one thing in common, said Keenan: "We want to really challenge the kids, and we want to expose them right away to what a professional theatrical process is like." "The Art of" spotlights creative skills that enrich kids' lives. Got a class or teacher to recommend? Email us at ideas@kidsvt.com .